Green Fairy Quilts: Home Sweet Home! This is the view I grew up with and I tell you, I don't think anything can beat the beauty of Lone Peak in the Rocky Mountains. I love the mountains and I miss them! There are mountains here in St. George, but not quite like this. For some reason this trip back home was a little hard for me because I just wanted to stay! This is my parents yard, they have 2 acres of land and my Dad has made it gorgeous with flowers and trees, I wish this was my yard now. 2 acres? Does anyone sell that much land any more? The reason for the trip home was a small "Spring Market" at Quilt Etc. 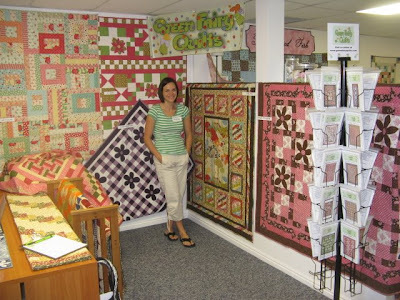 (a quilt shop) in Sandy, Utah. There were several designers there and we had a blast selling our patterns. It was too much fun getting to know Amanda, Karen and Monica, Mary, and Jodi Warner. What talented ladies! So, back home, I am enjoying the smaller mountains, but realizing that it is gorgeous here, but in a different way and I do love it. This is an older design, but I got my sample back so here you go: "Carrots and Peas," one of my favorite patterns. Of course I have to leave some pictures of my recent quilting adventures. I hadn't done shadowing until these two quilts, I think I like it! So, thanks for reading! I will be better about posting, it's just been one of those weeks. And for my blog readers I am offering buy 1 pattern get 1 free until my next post. Just tell me which one you want during checkout. Have a great day! Neat looking shop! 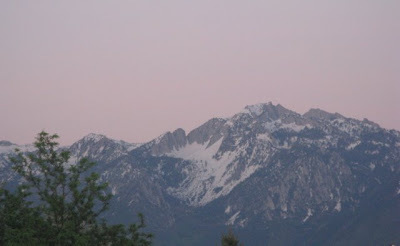 I love the mountains too and will be heading to Wyoming in August to see the Tetons and Yellowstone once again - lost track of how many times - love the mountains. 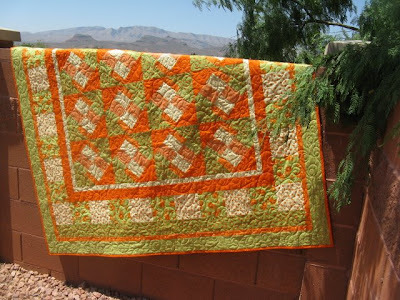 I just love both of the quilts and especially the shadow quilting. I love Quilts Etc. and Quilts Etc. Etc.!! I actually did a post about them on my private blog a couple of months ago when I made a mad dash to Sandy for some wedding fabric that had sold out up here. After the trip I'm sad to say it wasn't the right color and I had to improvise. I love seeing what you've quilted. Great job! Hello, Friend! It was such fun throwing fish at you. You are a kindred soul and so dang cute. Thanks for the linky...your the greatest! I can see why you love home, it is beautiful. Glad you had a good time there and with the quilt market. 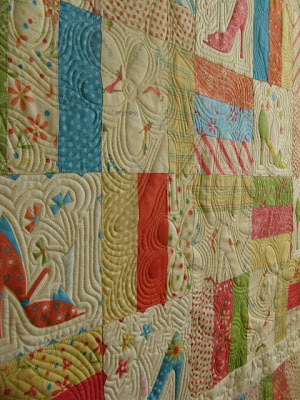 love the quilts as usual. What a beautiful place your parents live in the view of the mountains is quite breathtaking.I love your carrots and peas quilt, glad you had a good time at the show. I know what you mean about the mountains, I grew up in Salt Lake, I sure miss the Wasatch canyons, where we live now it is just rolling hillsides. nothing like hometown. oh and here in Oregon you can buy 100's of acres! can you even imagine that much? right now we live on 7 which is really nice.....alot of work though! Have to say, love the shadowing. Especially the shoes. But really who doesn't love shoes?!?!? Judi, The picture of your parents yard is wonderful. I'm down about 50 north of SLC so I have the beautiful mountains to look at. But your right, the St. George area is very beautiful in a totally different way. We love the red rock country and try to visit Southern Utah often, the Moab area, Escalante, Capital Reef, etc. Utah has such a variety of scenery it is just hard to beat. I'm glad you had a fun time and safe trip. I also had to tell you that I was so glad you posted a picture of Carrots and Peas because it made me really happy that I included it as one of my twelve choices. Really bright and beautiful. 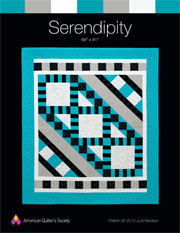 I know I've told you this before but your quilting talent just blows me away. For the first time doing the shadowing or echo quilting, it is amazing. So much talent. Thanks for sharing the pictures. Very nice shadow quilting. I love that effect. Nice, I enjoyed visiting your blog! Hey Lone Peak is my mountain! Fun. We have 1 1/2 acres. I would have a very hard time living in a 1/4 acre or less lot. I am spoiled. 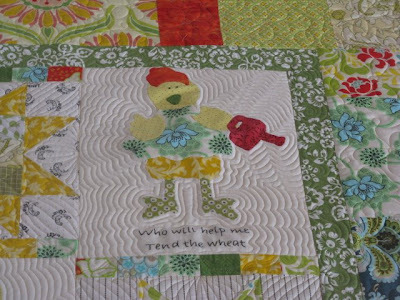 Love the chicken quilt.